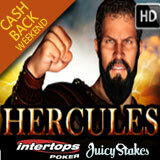 It's a Cashback Weekend at Intertops Poker and Juicy Stakes Casino this weekend! Bust a deposit playing any of their real-money slots from Worldmatch and they'll give you 35% of your last deposit back. If you play Worldmatch slots March 2 – 4, 2018 and don’t win anything, you have until Wednesday to ask for 35% of your last deposit back. Live chat is the easiest and quickest way to request Cashback but refunds can also be requested by e-mail or telephone. Play Worldmatch slots without winning and get a 35% refund on last deposit. You can get cashback after playing any of the slots under the Worldmatch tab within the poker software, but the Hercules HD is expected to be one of the most popular this weekend. In this epic high definition game, the Roman hero and god slays the Hydra, captures the Cretan bull and brings back Cerberus. He also rewards players by multiplying their bets in a stunning Bonus Game. Although Intertops Poker and Juicy Stakes are best known for their active online poker rooms, they both have a huge selection of slots and other casino games from Worldmatch, Betsoft and Lucktap as well. There are over 130 games under the Worldmatch tab alone – dozens of slots as well as Video Poker, Blackjack, Roulette, Baccarat and Craps.